I really hoped that I was going to enjoy this bind up of the six- issue comics. 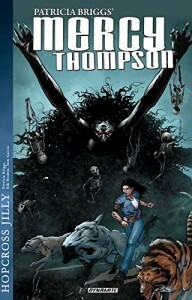 In the past I have read many of the novels in the Mercy Thompson urban fantasy series. The idea of shape shifters has been an immediate sell for me since I read the Kate Daniel series by Ilona Andrews. The pacing and point of view of this novel prevented me from being able to delve into the world. While I understand that graphic novels are a quick read and as a result they will not cover as much as a traditional novel, I didn’t feel that it fit in this case. The novel continuously switched back and forth between both Mercy and Jesse. I found this to be a bit disjointed and annoying at times. The plot was an interesting concept, but I was just unable to stay focused for the duration of the novel. I found myself forcing my way through and eventually I had to give up (only making it halfway through). I believe that this graphic novel would be more enjoyable for those who may not have read the original series and as a result do not have high hopes that will inevitably be crushed. I received this for review from NetGalley.